Students at Hannibal’s Dennis M. Kenney Middle School are continuing to make a commitment to their education by excelling in the classroom and demonstrating outstanding character. 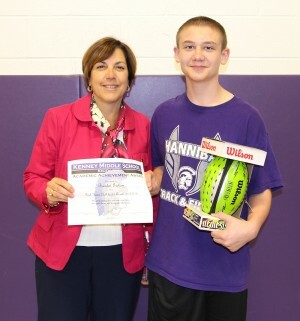 Hannibal Central School District Superintendent of Schools Donna Fountain congratulates seventh grade student Brandon Graham during a third quarter character education celebration at Dennis M. Kenney Middle School. Brandon was invited to the celebration for earning high honor standing for the third quarter and won one of the door prizes. 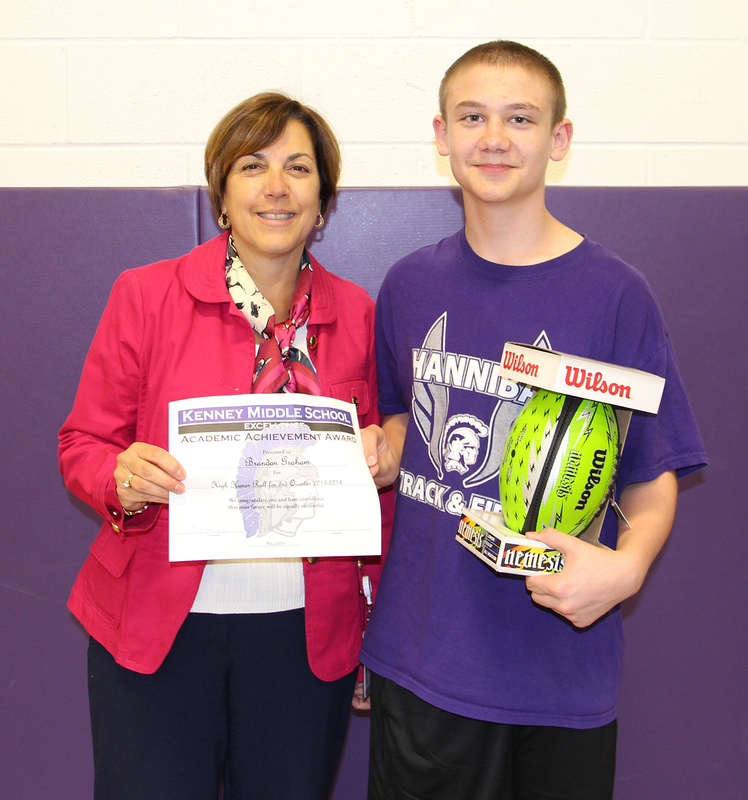 He has been on high honor each quarter of this school year, making this third quarter recognition a “three-peat” honor. An astounding 184 students from grades five through eight were invited to the school’s third quarter character education celebration where they were recognized for earning high honor roll status, honor roll status or raising their grade point average at least five points in the last quarter. An additional 94 students were also invited to the celebration to earn special recognition for perfect attendance. She also made a special point to recognize the “five plus” students. These are the students who increased their grade point average at least five points between the second and third quarter. “Earning a five-plus award takes dedication and a considerable amount of work,” she said as she led the celebration in a round of applause. Froio also took a few minutes to recognize the students she referred to as “three-peat” honorees. These are the students who have earned honors at the first quarter, second quarter and now third quarter character celebrations. “I challenge each of you to make a clean sweep (this school year). Keep up the great work. I want to see each of you at the fourth quarter celebration,” she said. Austin Calkins, Mason Garbus, Jocelyn Guanciale, Kristin Kellog, Serena Mashaw, Lucas Mason, Benjamin Mustico, Phillip Nosko, and Olivia White. The foundation for academic success begins with good attendance habits. For this reason, students at Dennis M. Kenney Middle School are recognized quarterly for perfect attendance. 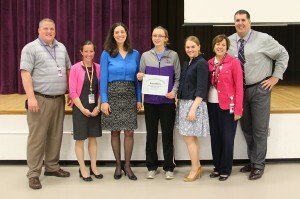 Reilly Harris was one student to earn perfect attendance honors at the school’s recent third quarter character assembly. From left are: KMS Assistant Principal Chris Tynan, KMS School Psychologist Meredith Furlong, KMS Principal Dee Froio, Harris, KMS School Counselor Meg Jaworski, Hannibal Superintendent of Schools Donna Fountain, and Hannibal School Security Aide Ed Brisson. Also, Kelsey Combes, Alyssa Emmons Hannah Heald, Jacob Kelly, Noah Kuc, Lea Kyle, Kelly Loveland, Emma Magnarelli, Dillon Plantz, Zachary Shortslef, Angel Wilber, Tyler Ward, and Steven Ward. Also, Alyssa Beck, Owen Calkins, Krystina Carnifax, Logan Chetney, Zachary Gombas, Brandon Graham, Jillian Hall, Velvet Howland, Hannah Kuc, Edward Lamb, Rebecca Marsh, Sean Mason, Ashlee Norris, Nichole Oleyourrk, Hayden Pepper, David Prrzepiora, Kaitlyn Ryder, Hannah Shattell, Madelynn Wakefield, Emily Weaver, and Makayla Zapanta. Also, Derek Cuyler, Tawny Forsyythe, Emily Goodman, Haley Goodman, Maria Guernsey, Sierrah Haas, Autumn Lanning, Kiersten Lathrop, Madison Leavea, Katie Pitcher, and Kennedy Vanburen. Honored at the celebration for earning honor roll status were students: Adam Catherman, Ayden Cleary, Magen Darling, Hunter Dumas, Trisha Fiumara, Calista Keefe, Isabella Long, Dustin Palmatier, William Phillips, Daniel Przepiora, Cameron Stuart, Riley Trumble, and Emma Wood. Also, Madison Baker, Jeremy Barnhart, Raina Bedell, Courtney Bullock, Joseph Cerillo, Calexander Connolly, Rachael Cummins, Nicole Durgan, Ethan France, Savanah France, Mykayla Harris, Noah Hosier, Mariah Hull, Miranda Lindsley, Nicholas McCombie, Zachary Moore, Ryan Nosko, Tory Paro, Jacob Powell, Brianna Simmons, Faith Smith, Erica Stauring, and Bradley Wiggins. 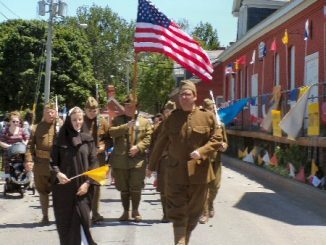 Also, Lilly Beaumont, Hailey Clark, Christina Cole, Ceth Deloff, Ciara Farnham, Patrick Hall, Erynn Harris, Jade Holmes, Cheyenne Hort, Nathaniel Hughes, Rebecca LaSalle, Kathrine McCraith, Kyle Olson, Seth Salmonsen, Devin Smith, Nathan Stuart, and Christina Thompson. Also, Erin Babb, Alyssa Harrington, Xavier Tompkins, Kiersten Abbott, Alexis Cole, Connor Griffin, Rebecca Hall, Brooke Ranger, Benjamin Simmons, and Tiffany Young. Recognized at the third quarter celebration for increasing their grade point average at least five points between the second and third quarter were: Ayden Cleary, Anthony Crofoot, Blake Donhauser, Hunter Dumas, Garett Durost, Hailey Hollenbeck, Calista Keefe, Zachary Loomis, Patrick Mcfarland, Jessica Litre, Michael Ryan, Geoffrey Schuler, Cameron Stuart, and Matthew Thompson. Also, Colby Adams, Keysha Ayala, Cameron Cardinali, Scot Crego, Mackenzie Davis, Nicole Durgan, Alyssa Emmons, Ethan France, Hannah France, Dominic Greenwood, Jacob Guernsey, MyKayla Harris, Hannah Heald, Cole Hines, Mariah Hull, Dalton Johnston, Andrew Jones, Kayliyah Knight, Alexis Loomis, Kelly Loveland, Kyriah Maliszewski, Nicholas McCombie Brittiney Mills, Zacahry Moore, Cheyenne Norton, Joacob Pierce, Nolan Raymond, Matthew Rheinwald, Makayla Ritchie, Faith Smith, Mackenzie Steinbrecher, McKayla Tuzinski, Hallie Waugh, Ryan Whitcomb, and Bradley Wiggins. Also, Trinity Barnes, Alyssa Beck, Cody Burmingham, Logan Chetney, Tyler Davenport, Rianna Harley, Nathaniel Hughes, Amberann James, Edward Lamb, and Jeremy Tassone. Also, Tyler Burdick, Kathleen Carr, Kyle Fowler, Joshua Good, Amanda Learned, Alyssa Nash, Kennedy Vanburen, and Christian Walter.